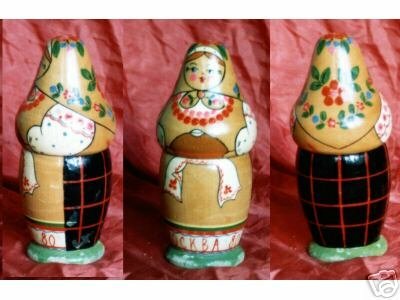 This beautiful Russian Doll is made in USSR before 1980 Moscow Olympic Games. The doll is made from cured Linden wood. The seller tried to open it, but couldn’t. Probably, it is single one. The doll is 5.75'' tall with very interesting shape. The Russian Maiden has bread in her hands and on her skirt is MOCKBA '80 / (MOSCOW '80). The doll is very well painted. There is some small rubbed off spots on the green base and on the black back side. The lacquer has very small cracks.